Did you miss us!? We have missed you all! I'm certain that during this hiatus you have all sharpened your pens and honed your skills! There will be several changes to the way we run this contest from this point on, including timing and prizes. It will also be subject to change from one contest to the next. The most important changes: we will now have fewer contest throughout the year and we will choose several winners for each contest. However, the winning backgrounds will not be enabled in game at the same time, but instead they will be spaced out for a period of a few months and significant dates will be saved for that particular period. Without further ado, let's give this a go! Our first contest will cover any holiday, activities or seasonal themes between mid-December to mid-March. Any theme goes! * Only original art is accepted. You must create the images yourself. * References to copyrighted intellectual properties should be excluded from the entries. Plagiarized entries, photographs, and other unsuitable entries may be removed without notice. * You may use reference materials for your work, but if you base your work substantially on a reference, please acknowledge it in your forum post. * There is no need to acknowledge any game art used as reference material. * Players may participate with as many backgrounds as they like and any player may have multiple backgrounds chosen as winners. * Previous work (that belongs to you) can be submitted for future contests as long as it fits the season. Avoid crops of past backgrounds that have already had a win and have been seen in game before. We are looking for new material! To make sure your entry is uploaded correctly, check using a tag search. * The entries will be judged by the Grey Havens' arrrtists and the winners will be put into future releases as a Limited Edition portrait background. * Winning portrait backgrounds may also be re-used for limited times later or could be adopted as a longer-term or permanent portrait background. * The same player may be chosen more than once for different entries. * Entrants may be asked by the arrrtists to make small changes to their designs. The winning entries will be included in the in-game list of available portrait backgrounds for a limited duration. Anyone in the game can use it when it becomes available. * Dread Masterpiece trophy if they don't already have one. * A surprise prize for overall winner! * Poe and doubloons for the free copy and the trophy will be delivered at the time the portrait is available in game. * Clothing or furniture can be any item in any colors that can be ordered from a tailor or a furnisher in game. No limited edition colors, no items that require a design to be created and no items that require a certain reputation to be worn or placed. * Make it look like it came right out of the game. * Get your line weights down, and compare with existing portraits to be sure. * Keep your lighting consistent with the lighting on the pirate portrait art. * Choose a scene that many in the game would like to use. * Take your time and rework, going to others for advice and critique. * A very small signature in the lower right corner is acceptable. * Avoid words - if you do use them, use them minimally, and only when they are not central to the understanding of the portrait. * The composition of backgrounds related to pirate placement is a major consideration and sometimes otherwise good backgrounds are eliminated because the nicest elements are blocked by the pirates once they are in frame. Edit: forums ate the apostrophes! *SCREECHES* ALL MY YESH!!! Have missed this SO much! Already on the last one I'm thinking of cleaning up the outlines to make it crisper & smoother, and adding more detail to the bird. But all sorts of feedback would be greatly appreciated!!! 3. The white snow outlines are too thick, the other white on the ground just falls away and makes it look odd. The ideas are amazing, keep on the good work. Glad to hear that this is back! 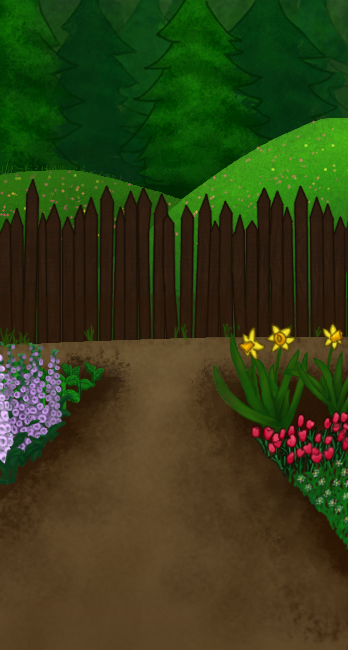 :) Very excited to draw up some new backgrounds for the contest! Glad to hear that this is back! 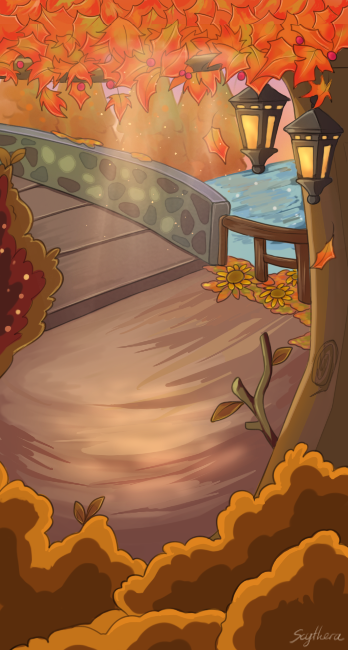 :) Very excited to draw up some new backgrounds for the Autumn season! That's beautiful! 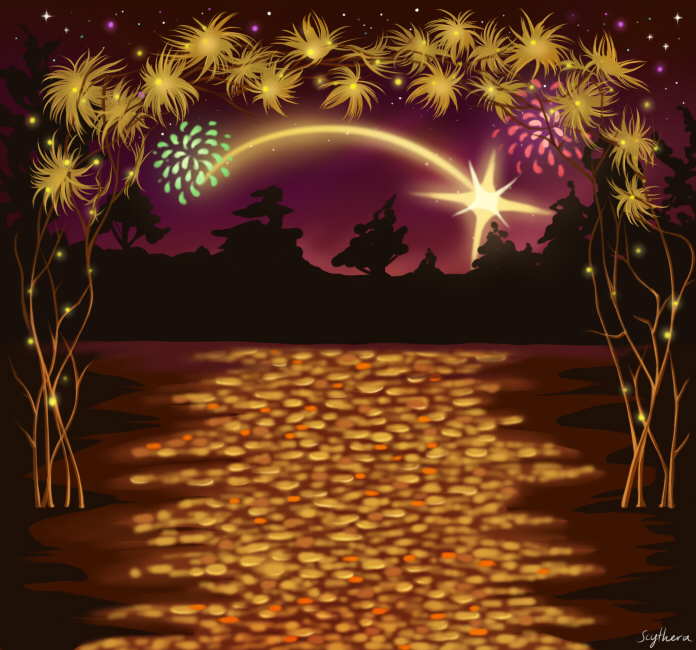 A great background for the chilly October or November evenings. But the time range they're looking for is between mid-December to mid-March. I suppose that could be Autumn in some parts of the world, but since it's not Autumn in YPP-time I don't think that's the best way to spend your effort. Definitely keep that one for next year though! Could we see them with the cutouts on top? also any suggestions on how to make this look better? Have you used GIMP before? It's completely free and should have everything you need. It can be a little tricky to figure out at first but if you need, there are plenty of tutorials out there. I tend to draw and ink my lines on paper, and then color the scanned (or photographed) version with GIMP. The portrait backgrounds I have made before were done with a free drawing app on my kindle fire called Sketch n Draw Pad HD, but that one takes more work so I don't use it much anymore. Have you used GIMP before? Seconded, GIMP is nice. I wrote up a suuuuuper simple tutorial for it ages back, and if that may help you, please let me know!! 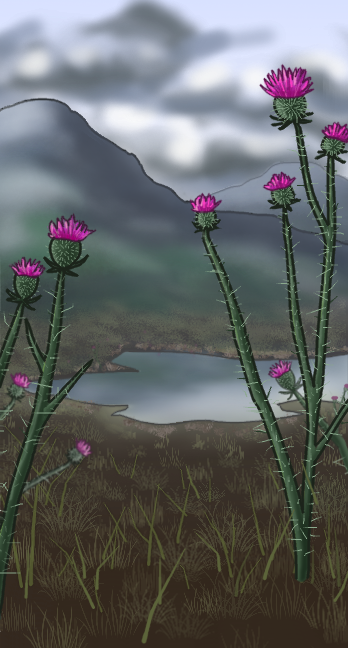 Lately, I've been drawing with a free program called Krita. Its selection of brushes is so great, and you can do everything you need to on it. @ Scythera. I like the fireworks background you're working on. The water just still seems a bit... off for me. Can't say what it is tho. @ Acidd. The idea is so fun! But I'd really need to see it with a pirate in it as well. The up and down edges might get cut off and that'd be a shame. Plus, he's then wishing his pirate friend to keep the scurvy away. I think what might be missing is [the water leaving shadows where it dips down in places]. Yours currently looks more like a sprinkling of yellow and orange petals instead of a reflection on a wavy surface. 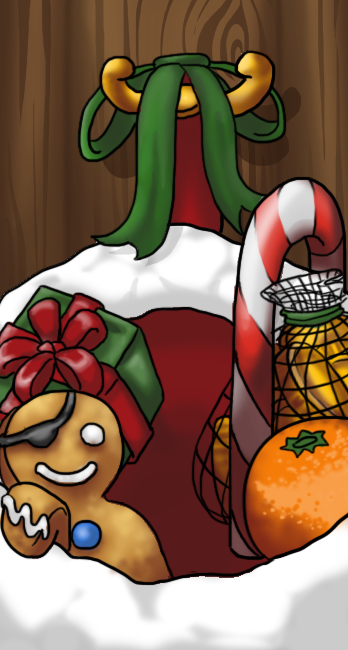 As far as being "hung in a stocking"- I think the effect is a bit lost on as the rim swings beneath the pirates feet. I sort of see them standing on the rim. Also- the upper left and right corners seem a bit empty- though I've no idea what would go there and make sense. 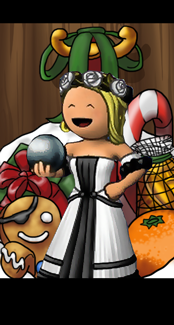 Also also- I'm not sure if you want to toss something behind the pirate (in case of ghostly pirates getting portraits) the present box would look like it's floating at an impossible position! Also also also- ginger pirates! Sooo, oddly enough I just came up with the idea for something. In The Netherlands we have this typical new years treat..
Clotho, is there a reason the new entries are not displayed in the portrait backgrounds category on YPPedia? Is there any possibility of having an ongoing entry list? 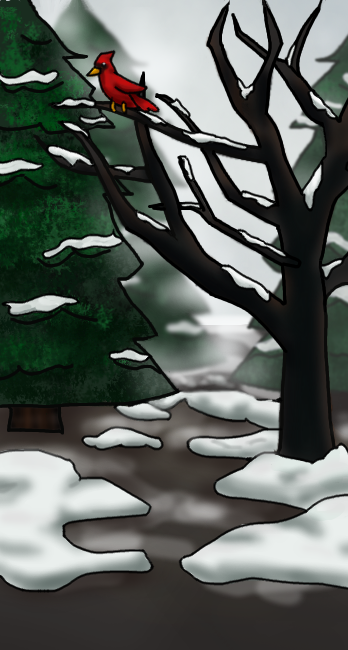 I don't have much time to draw during the semester, but once I'm off for winter break, I can draw so many backgrounds. With the time that this contest covers, I was hoping it'd have a longer due date than it does. Yay Cattrin! I saw your entry with the rum jug in it instead of the orange. We do not have a specific schedule, it will depend on many factors, but we can expect a contest to happen every few months, depending on previous contest entries. At this point, I'd say work on things that inspire you, chances are you will be able to use them on any of the upcoming contests!